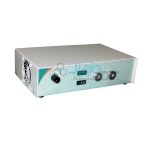 Jlab is renowned Halogen Light Source Manufacturer, Halogen Light Source Suppliers, Halogen Light Source Exporter, Hospital Surgical Equipments, Halogen Light Source India. Jlab are offering halogen light source. Jlab are prominent manufacturer and supplier of fiber optic source of source. Designed and developed in adherence to the set industry standards underneath the steering of knowledgeable professionals, this can be extremely acknowledged by the clients. This can be utilized in medical industry as a light source and known for its light-weight, supply and famed for its light weight, compact style, durability, dependableness and user-friendliness. Apart from this, our offered product is strictly tested by our quality controllers on well-defined parameters to assure its perfection before dispatching at clients finish.